Learning a language as a high school student, I thought I would never use it. Who spoke Spanish in rural North Carolina in the 1970s? Fast forward many years and you’ll find amazing little tiendas and taquerías selling everything from tortas to Tejano CDs. Sure wish I’d paid closer attention to Senorita Black all those years ago. So now on my bucket list? Learn to speak Spanish. Luckily the Duke Libraries now subscribe to a new language instruction resource called Byki Online. With over 70 languages, from Afrikaans to Zulu, you’ll find blogs, flashcards, words-of-the-day, and many other tools to speed your conversational skills. Veseth, Michael. Wine wars : the curse of the Blue Nun, the miracle of Two Buck Chuck, and the revenge of the Terroirists. Rowman & Littlefield, 2011. When I buy wine at the grocery, I stare at 500 different choices on the “wine wall,” and often walk away without making any purchase at all. According to economist and wine blogger Mike Veseth, there are more choices for wine than for any other product in the supermarket. 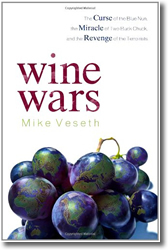 In his insightful and amusing new book, Wine Wars, author Veseth explains the complicated world of wine, analyzing its past and predicting its future. He begins with the wine wall. Typically, the expensive wines are shelved at the top and the cheap wines at the bottom, as most wine consumers shop by price, usually within a narrow margin. Within the price strata, New World wines are organized by country, then by brand/grape/region. Old World wines are organized by region, such as Bordeaux and Burgundy. Wine is complicated, even at the supermarket, but Veseth, a university professor, clarifies the global wine business for the uninitiated. As an economist, Veseth also teaches about forces that influence the production and consumption of wines, notably the markets of three top importing markets, the UK, Germany and the US. The industry is changing under globalization, as corporations produce high volumes of inexpensive brand named wines for unsophisticated consumers who look for a consistent affordable product. Giant wine producers take up much of the wine wall, and garner much of the restaurant business, making it harder for Old World producers to compete. Gallo has several familiar brands at every price point (Turning Leaf, Barefoot Cellars, Redwood Creek etc) squeezing out small wineries in France and Italy. Growers in Old World countries worry about the end of their small operations, and the unique quality and character of their wines, which reflect the local soil, climate, culture and traditions. As consumers, wine enthusiasts worry about wine becoming a homogenous commodity. Yet Veseth remains optimistic. He predicts that in the future more clarity and simplicity will be injected into the wine markets, giving consumers more confidence, and they in turn will buy more wine. A consumer who begins by drinking Two Buck Chuck often graduates to more sophisticated tastes. Globalization will bring more consumers with more choices for everyone. This rich volume with peppery overtones is the perfect match for anyone wanting to know more about the business of wine. Recommended. Libraries’ spending for e-books is increasing dramatically; and Duke Libraries have developed a detailed and thoughtful strategy to help drive the development of optimal e-book functionality for researchers. 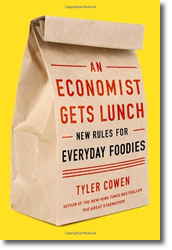 I reviewed An economist gets lunch last week in its Barnes & Noble e-book format to see how close this particular e-book tech and tool suite came to matching my own expectations for e-book functionality and academic productivity. I defined “academic productivity” as interacting in a time-effective way with the e-text to produce a semi-scholarly end product — the book review. The “Bad” (No cloud storage or syncing) – Before starting the process, I had hoped that the highlighting and annotations features of the Nook for PC software would allow my interactions to be saved in the cloud and synced to my Nook Simple Touch e-reader. Alas, this is not the case. Highlights and annotations made on one Nook software platform or device, stay on that device and are not saved to the cloud and synced across a user’s Nook devices. This has been a known problem with Nook for at least a year, and may negatively impact its usefulness for academic work. I was limited to working productively on the Nook for PC software on my work computer. No copy & paste available – It’s understandable that publishers and authors wouldn’t want large amounts of text to be easily copyable; but the inability to copy & paste small amounts of text for quotes in more scholarly papers means users will be re-keying text. A publisher of CD-ROM-based theological e-texts, Libronix, permits copy and paste, and automatically embeds a properly formatted citation following the copied and pasted text. E-books would certainly be more useful if this feature were more widespread. The “Good“ (interface & highlighting tool) – The Nook for PC software has a clean interface and the collapsible side menus for the table of contents and tools make it easy to use. Text in an e-book can be selected for highlighting or annotation with a right mouse button click. Both highlights & annotations are saved to their own lists in collapsible side columns. A highlight will display about the first 15 characters of the highlighted text; and an annotation will display the same number of characters for a reader’s note. Both of these tools are handy when you need to navigate the text to re-locate key passages. But the highlight and annotation fill colors are exactly the same, and cannot be customized. This makes it difficult to distinguish between the two types of user interaction when viewing a page without the side columns expanded. Suggested improvements – The lack of syncing needs to be corrected soon. While my personal preference for working with and producing digital text is still a standalone physical keyboard & mouse, more users than ever are interacting with e-books on tablets, phones, and e-readers. The inability to view and edit my interactions with e-text across devices was an annoyance, and tied me to a single device and location. Other users may find this defect to be a deal-breaker when choosing an e-reader product family for purchase. Despite the above criticisms, I still found the experience of reading, and marking for later review, passages in the e-book to be a more time-effective way for me to interact with text than working with the print book when I needed to produce a deliverable. It will be interesting to see how well e-book publishers and their software developers react to the needs of the academic market, as opposed to the consumer reading market. Librarians have a key role to play in communicating and making sure publishers understand the unique needs of our users and market.